Renaud Lavillenie was above them all, figuratively and literally. The man from Barbezieux-Saint-Hilaire, reigning Olympic champion, didn’t deign to pole vault the first two heights of 5.50 and 5.65 meters. He was after all the world record holder at 6.16 meters. The men’s 800-meter finals were on, and he wasn’t doing anything anyway…so he watched David Rudisha win gold while he waited on his competition to get through their pedestrian heights. 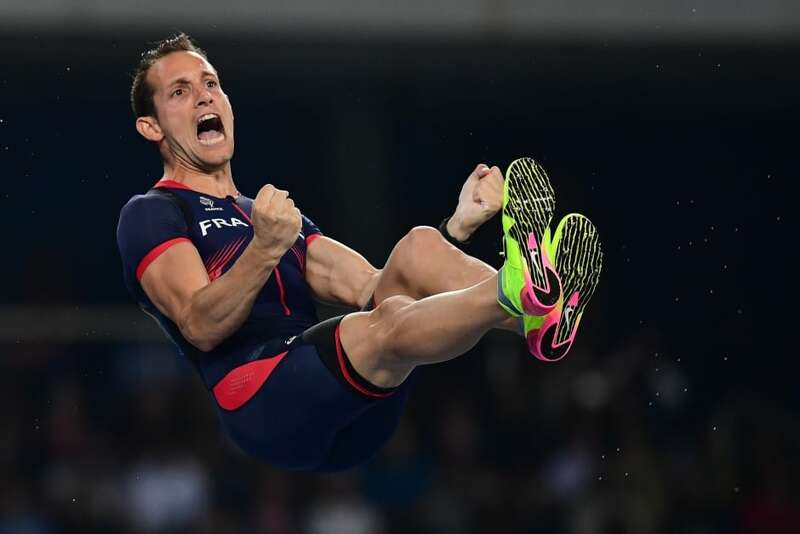 When his rivals reached 5.75 meters, Lavillenie decided to join the competition. With the crowd clapping and cheering, the Frenchman rose above the bar with ease. As he did at 5.85. The bar was raised to 5.93, which the announcer said was about the same as “vaulting over the average house”. In other words, the bar was getting pretty high. Lavillenie is up first and he makes it with a roar. The Frenchman is yet to miss. But 5.93 proves to be a few centimeters too high for Jan Kudlička of the Czech Republic, Piotr Lisek of Poland and Sam Kendricks of the US, the eventual bronze medalist. Hometown favorite, but relatively unknown Thiago Braz da Silva of Brazil, also misses his first attempt at 5.93. But the 22-year old from the town of Marília, Brazil, running to the cheers of the crowd, makes it over the bar. And now there are two. The Champion versus the Kid. Lavillenie readies himself to win his second consecutive Olympic championship in the pole vault. He is up first, waits for the bar to be raised to 5.98, and clears it easily. By making 5.98 meters, Lavillenie has set a new Olympic record. The young Brazilian, on the other hand, has never won a medal at an international event of any significance. He’s young, is improving very quickly, and clearly ballsy. Instead of trying to match Lavillenie at 5.98, da Silva says he wants the bar raised to 6.03. da Silva’s never cleared 6 meters, and yet he’s going for it. Lavillenie calmly sips from a water bottle, sharing laughs with others. Da Silva fidgets with his poles, deciding which one he should use to propel him to new heights. With the new height, it’s back up to Lavillenie. He makes it over on his first attempt, but grazes the bar with his right hip on the way down – it’s the Frenchman’s first miss. The pressure is intense. da Silva runs to the pit, extends the pole, but just as he raises off the ground, he gives up and falls harmlessly to the ground. It’s back to Lavillenie, a man who’s cleared this height many times in his career, encouraging the crowd to clap. And again, Lavillenie clears the bar only to knock it off as his stomach hits the bar. That’s two misses. Lavillenie sits in preparation, his face clearly showing concern. He’s likely thinking, “Where did this guy come from?” Looking for answers in the ground. he walks around to screw up his concentration for one final, enormous leap. Lavillenie decides to raise the bar, setting it at 6 meters 8 centimeters. If he makes it, da Silva has to make a very high leap. But the stakes are high for Lavillenie – miss it and the gold falls from his grasp. The champion zips up his suit as he readies his pole for flight. He runs, he plants his pole, and he launches into the air. But this time, on the rise, Lavillenie’s feet hit the bar, which falls to earth. A new champion has been crowned – Thiago Braz da Silva is an Olympic champion, and Brazil’s newest hero. 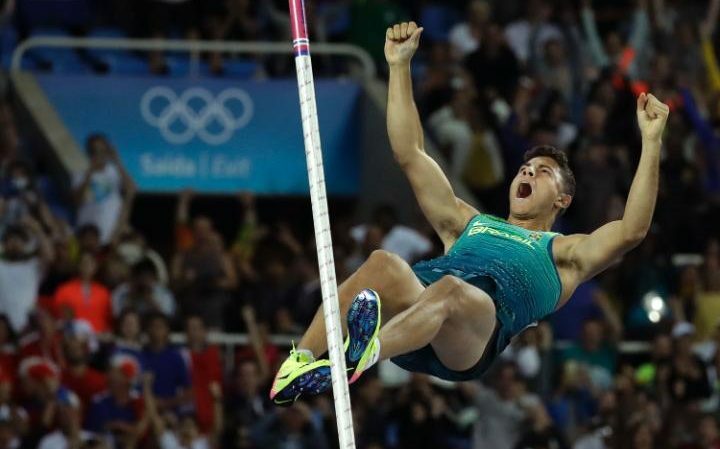 No Brazilian has ever qualified in the Olympic pole vault. But in these Rio Olympics, da Silva not only competed, he set the Olympic record and ripped gold from the champion’s hands, vaulting into the hearts of Brazilians all. Posted in Rio Olympics, Track and FIeld and tagged David Rudisha, Jan Kudlicka, Piotr Lisek, pole vault, Renaud Lavillenie, rio olympics, Sam Kendricks, Thiago Braz a Silva. Bookmark the permalink.